Rep. John Boehner (R-OH) will likely be re-elected Speaker of the House of Representatives – third in line to the White House – despite mounting opposition among the Republican rank and file. Boehner needs a majority of the votes from members of the House who are in attendance to vote. Several Democrats are absent because they are attending the funeral of former NY Governor Mario Cuomo and others will not make the vote because flights coming into Reagan National Airport are being held at their destination and flights in the air are being delayed from landing for inclimate weather, according to Politico. Fewer Democrats in attendance means a lower threshhold for Boehner to be re-elected. As House membership takes their seats – most with family members in tow – this could make for an interesting day of events that are typically ceremonial in nature. C-Span will carry the nomination and election process live online. This challenge to House leadership could be a signal of things to come in the Republican-led 114th Congress. Boehner led a staunch opposition to the Obama Administration agenda on behalf of the Republican party since his election to the Speaker's post for the 112th Congress. Consequently, the 112th and 113th congressional sessions were, respectively, the first and second most unproductive sessions in modern history. 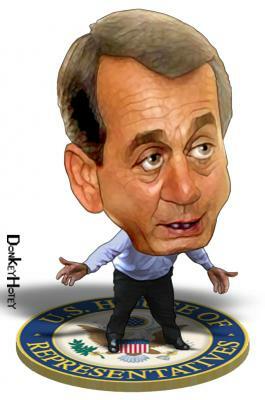 The fact that Boehner's leadership is under siege from the conservative Tea Party-led wing of his party is somewhat surprising because the Speaker is hardly thought of as a moderate. Boehner is simply not conservative enough for his Tea Party colleagues. Instead, the Tea Party faction would rather see someone like Texas Rep. Louie Gohmert take the gavel with a "no compromise" approach to President Obama and the impending barrage of vetos that are likely to return to Congress from the Oval Office. Many insiders expect Boehner to retain the Speaker's gavel even if the challenge gains momentum, but the prospect of a Republican coup will serve as a warning shot across the bow of moderate Republicans and Democrats alike. Strap yourselves in folks. The run up to 2016 is going to be a bumpy ride.